After reading our Kukees review and how they are like delicious baked cookie dough, I am sure you are ready to enter to win your own box of these delicious treats! 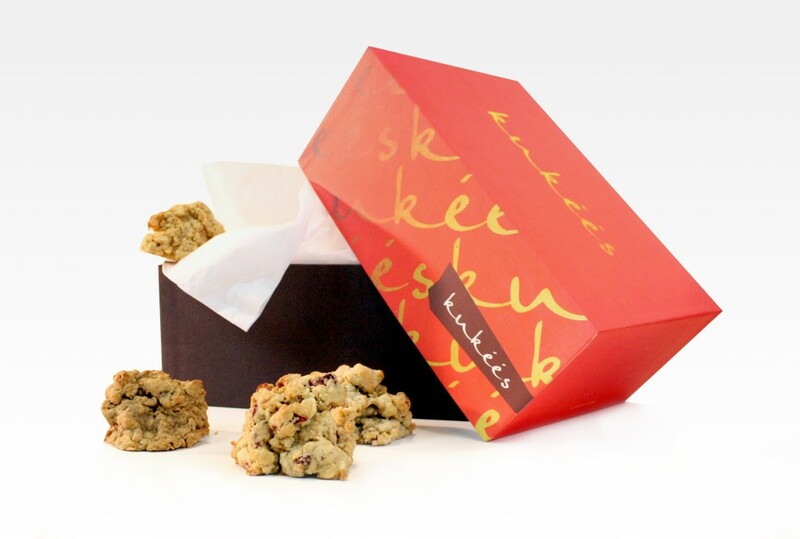 We are giving away a box of Kukees to one very lucky reader. Giveaway is open to the US only, ages 18 and older. Giveaway ends January 29, 2012 at 11:59 pm EST. Good luck! I would love to have the Double Chocolate Chip and/or The Reese’s Peanut Butter Cup! They look delicious! I learned that they come with 3 grams of fiber! I would like to try the Reese’s Peanut Butter Cup one! Would like the choccolate chips. The dark chocolate cherry cookies sound delicious! I want to try the Double Chocolate Chip. Thanks for the giveaway! The half and half box with the White Chocolate Macadamia and Reese’s sounds so good! Reese’s peanut butter cup and white chocolate macadamia! reese’s and turtle sound delish! I learned that Kukee’s don’t contain any preservatives or hydrogenated oils. That’s awesome! If I am lucky enough to win I hope for the HALF and HALF BOX in DARK CHOCOLATE CHERRY and PEANUT BUTTER BANANA Yummmmy I am going to get cravings and have my mouth watering with every entry! I learned that Kukees contain no preservatives. I would choose the half & half box with Reese’s Peanut butter Cup Kukees and the pumpkin white chocolate Kukees. I’d love the Half and Half with White Chocolate Macadamia and Turtles! I would love to try the Reese’s Peanut Butter Cup cookie dough! I would choose the half and half box with turtle and double chocolate chip. ‘double choc chip’ and ‘turtle kukee’ in the ‘half and half’ box….please! I’d love the reeses peanut butter one! Reese’s Peanut butter cup in the biti bites box!! I’m drooling now!! I learned they will do a rush order! Sounds pretty good right now! I love the Reese’s Kukees in the Half & Half box (I would do the other half with the Turtle flavor). I would love to try Triple Raisin Oatmeal. I’d love to get the White Chocolate Macadamia! I’d like to try the pumpkin white chocolate or Reese’s peanut butter cup. I would love the chocolate cherry!! Oh Yummy! Double Chocolate Chip. I would love to try the turtle kukees. The White Chocolate Macadamia sound awesome!!! I would like the Reese’s Peanut Butter Cup ones in the Fav Dozen. If it was the right season I would really like the Gingerbread Chocolate. They have no preservatives or hydrogenated oils. I appreciate that! Would love the double chocolate chip! I learned about Kukees, I had never heard of them. Thank you so much for bringing them to light! I learned that someone has created my dream Kukee!! I remember so many days with my dearly departed best friend eating raw cookie dough… we could only get a half dozen or so baked every time. like that I can get more than one kind in my order. I would love the Peanut Butter Banana, Pumpkin White Chocolate, and the Turtle Kukee. I learned that the flavor I picked was only available until Dec. 31st. So I would like the peanut butter banana. I really learned I need to read the entire post. I learned that they are individually wrapped and labeled AND they have Bit BItes which are 1/3 of the originals size. I would get the MixItUpBox which is 2 of each of the Original flavors. It is also too late for the Holiday flavors until next Nov.1. They’re just like cookie dough, only baked! I would like the Cranberry Orange Zest with White Chips if win. I would love to try the Turtle Kukee. Since the Turtle Kukee is a holiday flavor guess I can’t pick that one lol. I’d like the Biti-Bites Box so I could try all the non-seasonal kukees, and still have some to share with my bf and son. What I would REALLY like would be the Gingerbread Chocolate or White Chocolate Pumpkin varieties, but apparently they are no longer available 🙁 So therefore, I’d love to win the white chocolate macadamia, dark chocolate cherry, or double chocolate chip. I like that they do not use preservatives. Kukees have three grams of fiber! Double Chocolate Chip would be my flavor of choice! I would get the half & half box of double chocolate chip and Reece’s peanut buttercup. I would love to get the Half & Half box with Turtle Kukee and Reese’s Peanut Butter Cup. The Peanut Butter Banana and Pumpkin White Chocolate sound delicious. Any box that has the dark chocolate cherry cookies in it! I would try the reeses one! no preservatives and they’re individually wrapped! I would love to try half box Dark Chocolate Cherry and half box Double Chocolate Chip. Then, later one of each!! I like that they do not contain any preservatives or hydrogenated oils. I would love the White Chocolate Macadamia cookies!!!!!!! I’d like to try Double Chocolate Chip, Peanut Butter banana, and cranberry orange zest with white chocolate chips. the white chocolate macadamia.. yum! Reece’s pb cup and turtle kukees.